Banana Death is named after a dessert at a Colorado Springs restaurant, but it is fitting for me since I eat a lot of bananas while I train for triathlons and other endurance events. This is a main place for me to talk about my training, but you'll certainly see other thoughts and experiences as well! The alarm went off a little bit earlier than usual, as being in a bigger city it takes more time to get places. 3:35am was the wake-up time today, but at least coming from mountain time it was 4:35 to me. I went through my routine with no hitches and was ready to go when Robin and Kevin pulled up. We made our way to the Santa Monica Civic Center to park. A bit of race traffic, but we had plenty of time. They even had plenty of port-o-potties at the loading area. We got on a bus and a few minutes later we were on our way to Dodger Stadium. We took a slight detour (apparently they didn’t tell the bus drivers the specific route with road closures) but we got to the right spot just before 6am. On the bus I chatted with a school psychologist who was doing the first half in a charity relay. She told me to keep my eye out for the guys in bikinis on go-go boxes when we got to sunset blvd. I couldn’t wait for that! She told me the course was awesome and I would really enjoy it. Then we wandered over to the not so crowded bathrooms. Yes, finding bathrooms is a key event before a race. Fortunately, this race had plenty! There isn’t much to do other than stay warm, make sure you have your nutrition ready, drop off any extra clothes in the gear check, and then do a warm-up (maybe) and line up. With almost 23,000 people doing a race, corrals really are corrals. 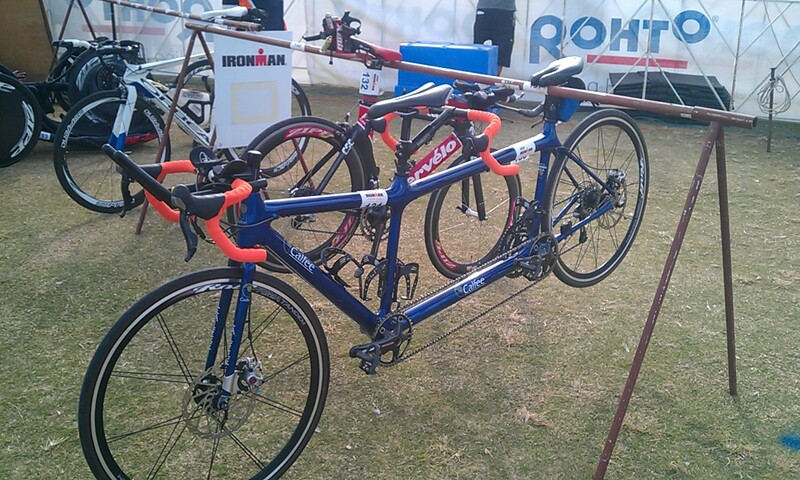 Robin and Kevin and I gave our good wishes and went our ways to do our own race routine. I dropped of my gear and a guy hoping to do a 2:40 made light conversation with me. I then made another stop at the port-o-pottie and then hung out a bit by the portable light, as the generator generated some heat as well. It wasn’t raining, but it was a bit cool for California! The other athletes hanging around were friendly and we all shared the “we got up way too early” look. I finished up my UCAN mix (chocolate and cran-raz) at about 6:45am - right on schedule. 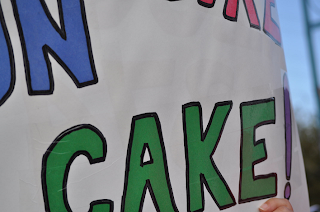 I chatted with a guy named Rupert from California who ran the Pikes Peak marathon last year. One more quick stop and then on my way to the starting corral I stopped in the stadium, which they had open. Lots of runners were hanging out in there, and it was quite a bit of a wind block and a bit warmer as well. I found my way to the outside of the corral and it took a while to actually get in. 23,000 is a lot of people. Yancy and Heather kept me in good conversation and also told me how awesome the course was. They had both run the race last year in the monsoon. One of the Pussycat Dolls sang the national anthem (quite well, actually) and we wiggled our way closer to actually being in the corral. 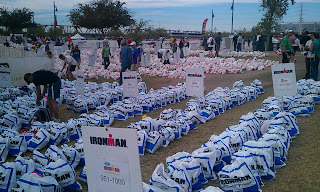 A few minutes before the start, clothes were being strewn everywhere and we made it into the corral. I shed my cheap poncho that was keeping me warm and was ready. At 7:30 the race started and at 7:38 I crossed the timing mat and had officially started my race. A lot happens in 4+ hours on a marathon course, so I will do my best to recall the cool stuff. First, the hills weren’t bad at all thanks to extra oxygen being at sea level and doing some solid hill repeats in my short time training for this! The course was actually more downhill than I anticipated. My plan - run 4:30 and walk :30. My new Garmin 910XT was set to buzz each intervals for 26.5 miles (gave myself a cushion for zig-zagging and that turned out to be perfect.) So there I was, taking walk breaks about every half-mile. This worked really well for me. The running intervals never seemed “too long.” I modified a little a few times due to aid station timing, because if I needed water, I took water. I remember running through Chinatown, seeing signs for Olvera street, which I used to go to in the summer when on vacation in LA. We wound around a bit in downtown and we went by the Walt Disney theater, in which I can say I’ve actually been and seen a concert there. We got to Hollywood Blvd and I caught up to Yancy and Heather and passed them. Around mile 10 I had to pee, but I didn’t want to stop. But I didn’t want to “just go” today (might have been different if it were raining!) Just past the halfway point I decided to stop at a port-o-potty stop and there were about 6 or 7 ahead of me in line. This stop took about 5 minutes. I stopped my watch so I would get actual running time. And yes, I did remember to start it up again! Legs were a bit stiff once I got going again, but they loosen back up in about a mile. Hollywood Blvd to Sunset Blvd (familiar roads for me from my many summer vacations to LA as a kid) down into Beverly Hills where my mom and Oma would be. And I saw them - they were near mile 17. I actually yelled at them so they would see me. I stopped and gave my Oma a hug, they took a few photos and I went on my way. My quads were hurting (they had been since early on) but otherwise I felt really good. My nutrition plan seemed solid as I was able to keep pace. The crowds, the street bands and DJs really helped keep me moving. So much fun to see everyone out there. Some spots weren’t crowded, others had tons of people. Each time my watch beeped for my walk-break to end, I was ready to run again. This was a good sign at mile 18,19, etc. In my first marathon I had really slowed down at this point and my run had been a shuffle and it was a struggle to get running again. Around mile 18 I passed my distant cousin, Kevin, who didn’t seem to be doing as well as he would have liked. But I gave him a cheer and went on my way. Once I hit mile 20 and still was feeling good (relative term!...legs hurt, but no issues.) I knew I would finish strong and that pumped me up even more. So down to the beach we went and those last few miles I tried to push the pace. I still took my walk breaks and got a lot of encouragement from spectators. A lot of runners were stopping to stretch these last few miles, but I had gas in the tank. The last mile I skipped the walk break. I ran strong and was so glad to get to the finish line in under 4:10. 4:15 was my “I’ll have a good day and be happy” time, so 4:09:12 was awesome. And my watch had 4:05 because of the stop I made half-way. Once I crossed the line I got my medal and ran into Vicky who was waiting for Kirk. She ran a 3:35! I grabbed banana and bottle of water, a blanket, and my gear all very quickly. It was efficient! I put on my jacket and long pants from the morning since the wind was really strong. I found the “buffet” and grabbed some snacks and then headed to the family zone to find my mom and Oma. They were there as anticipated with my bag of clothes and an extra bag of water. I opted not fight the crowds to head back to the change tent so we walked a few blocks to the car. I mixed up my recovery UCAN and had a good drink for the ride home. A very successful day! A new marathon PR for me, perfect running temps in LA, a great visit with my grandparents with my mom. Race weekend is here! Time to get out to LA for a little break and run a marathon while I am there. Plus visit my grandparents with my mom, and meet a cousin and her son who are also running. So despite the forecast for rain, it should be a nice weekend! I got up at 4:30 (wow- and it’s not race day! ), my mom drove in the night before from Divide, and we left a bit after 5:30 to get a 8:30 flight out of Denver. On time and eventful, just how I like ‘em. When we arrive in LA and it’s overcast with some light rain and temps slightly under 60. We are definitely in LA! We hopped shuttle to Westwood, where my grandparents picked us up. A nice lunch of bagels & lox and some chill time. A few hours later I got picked up by a friend of a friend and we met up at the friend’s place (Vicky), watched FSU pull of a victory agains St. Bonaventure in the NCAA tournament, and then headed out to the Expo at Dodger Stadium. A little irony here because my brother, nephew, and uncle are in Phoenix to see the Dodger’s in spring training. The guy in the foreground is Kirk, the friend of Vicky. I know Vicky from Girls Heart Rockets. Kirk, Vicky, and I walked around the expo for a bit and hit up some of the vendors for an afternoon snack. That tided me over until dinner. I also “ran” into Meb at the expo. Generation UCAN is my main fuel source for endurance events. (Try it! Get 10% off with coupon code UCANTRIND). Then we found our names on the Honda vehicles. that's me in the very bottom corner! Then back home for dinner, which was a yummy kale salad, veggie & goat cheese ravioli, and I added a few slices of turkey to get some more protein. I slept in until 7am, waking up a couple times, but pretty good rest being at sea level! At 8am my mom and I got picked up by a high school friend of my mother’s. 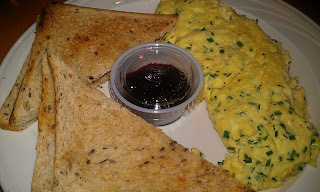 We ventured out in the rain the short distance to the Beverly Hills Hotel and had breakfast at the Polo Lounge. 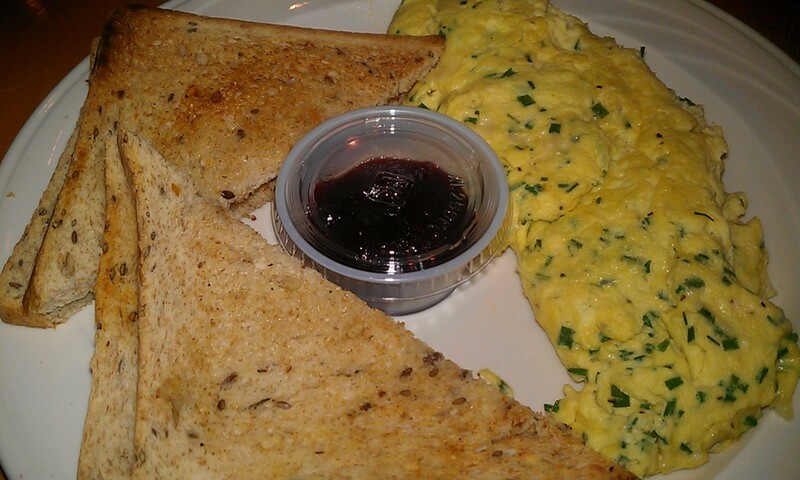 I picked the egg white frittata and added some toast. Yum! I was pretty full after this meal, but it was a great day-before-the-race breakfast. The rest of the morning was pretty relaxing, and it was a good day for being lazy since it was raining with some heavier downpours every so often. But by 1pm the rain had lightened up enough for me to go for a quick run to make sure my legs were working. 3 miles around the hills of Beverly. In the afternoon a distant relative (but now not so distant!) and her son came by to visit. Robin (same first name AND occupation as the Robin with whom we had breakfast!) lives in NY and her great-great grandfather is the brother of my grandfather’s great grandfather. We had coffee and apple cake, and got to know each other a bit. They are both running and agreed to pick me up in the morning so my mom wouldn’t have to get up at o-dark-30 and drive me down to Santa Monica. Very nice! After they left I started to get stuff around for the race before we ate. 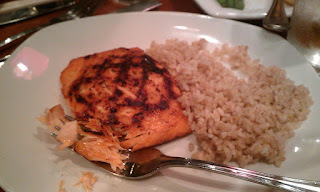 Dinner was salmon and brown rice as requested, with some carrots and green beans, and some more apple cake for dessert. In my Oma’s house there is dessert every day. Good thing I am here to run a marathon! I put my stuff together for the morning, as they were going to get me by 4:20. Bed by 9pm! A good friend of mine, Tim Bergsten of PikesPeakSports.us got together with the Pikes Peak Road Runners and organized a half marathon and 5k for Super Bowl Sunday. I wouldn't miss this inaugural event and the timing of the event was great, as it is 6 weeks before the LA marathon. So today, I ran! You can read about my race plan here, but it was executed well. I got a good night's sleep and DIDN'T have to wake up at 4:30am. Nope, slept in until 7! I had a low-key race morning, got all my stuff around and left the house around 8:35. Pre-race packet pick-up went well. I parked in the underground garage and took the elevator up (saving energy!) to the lobby of the Plaza of the Rockies. Had my bib number in about 5 minutes and then met up with Scott, Kim, and Nate of the Pikes Peak Tri Club. John showed up shortly thereafter. I ran into Ken from the Porsche club, and several Team In Training athletes as well. Tim and Karen Barry were there as well....a lot of people out to race! Despite the recent snowstorm that hit Colorado and made the national news, Colorado Springs didn't get that much so the trail was 98% clear. Although in the teens on my drive in, the temp was probably in the mid-20s at race start and low 30s when I finished. The sun was shining brightly and there was only a light wind. For Feb 5th winter weather, no complaints at all! In the hour that I had before the start, I made sure I had my hand-carry bottle with Nuun and a couple Hammer Gels in the zipper pouch just in case. I was going to use my race belt, but then opted to just pin on the number instead. I put my jacket, car key, and outer-pants in the gear bag and dropped it off. I went to the bathroom a couple times and did some dynamic warm-ups in the lobby. 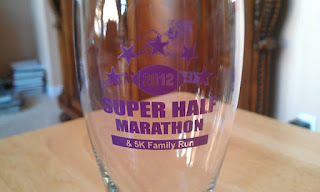 At about 10 minutes before "kickoff" I headed outside with Nate to do a little warm-up run. The crowd had gathered and shortly thereafter the gun went off. I am working with a run/walk for the LA marathon, so this was a great place to put it into practice. I set my Garmin to do 20 5min/30s intervals. I did my best to stick to an 8min pace for the run segments and just walked the 30s. I pushed myself pretty hard - I haven't run like this in a long time, as my Ironman training was a lot slower. So running hard for just under two hours is pretty tough on the body, though I knew I have the base fitness to do it. And the Generation UCAN really does provide steady energy. 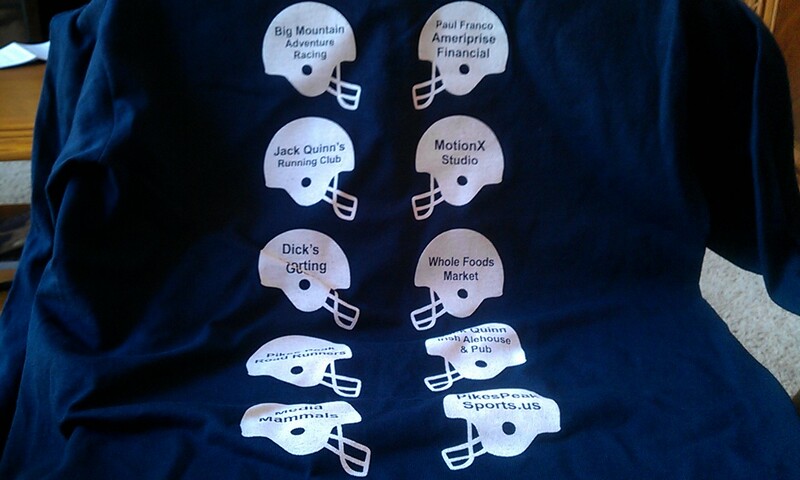 Here are my splits. Here's the Garmin data. I was running with a group of people, and I'd pass them running, and they'd pass me walking. I'd expected this to happen. I basically just tried to run as hard as I could without over doing it. The walk breaks were definitely welcome! I was so glad to see the turn around, as that meant over half the race was over (it didn't quite finish where it started) and I just tried to use my leg strength to push the pace. It was cool to see Kelly Ping out on the trail (she wasn't racing) as she's training for the Leadville 100 run. Yeah. Mark Good was at one of the aid stations and he gave me a little extra cowbell. But before I stood in line too long for the goodies, I realized I REALLY needed to eat. There were no snacks at the finish line and the half a gel I had over an hour earlier was long gone. So I hustled to the snack table and grabbed some bananas and mini-clif and mojo bars. That helped! I had to walk a block or so to get to my car and get my dry clothes, and then back to Jack Quinn's to change and enjoy the post-race specials. Once I was changed...and that was a challenge in itself...try putting on compression tights in a small bathroom stall...a table had opened up and I got a seat and then ordered the breakfast special and an Odell's Pale Ale. John, Nate, Scott, Kim, Tim, and Karen all joined in on some post race cheers. I chatted with Tim Bergsten to tell him I had a great race (and that there should be food and clothes at the finish!). He was really pleased with the turnout as it was about twice what he originally thought it would be. 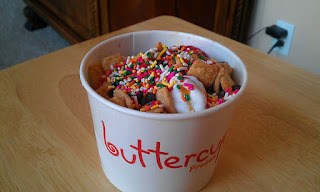 I left Quinn's but before I got back to my car, I stopped into Buttercup's Frozen Yogurt and got a snack for after I got home. Even though it was cold out, frozen yogurt treat sounded great! And it did taste delicious! So with super sore legs after a Super Half, I walked back to my car drove home and plopped myself on the couch to work a little and enjoy the Super Bowl. Happy 4th day of Hanukkah (5th night starts tonight so we're on the 4th day) and Merry Christmas Eve! I went for a run today at Fox Run Regional Park, a very hilly park a few miles from my house. I've done a lot of training runs here in the past, and it's great for building leg strength! 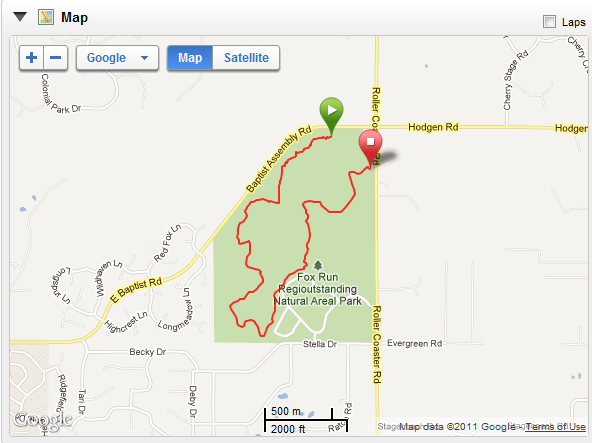 One loop of the park is about 3 miles with somewhere around 400 feet of gain. Today it felt like I was going up the whole time. But wow- what an amazing day - sun shining, snowy hills, and plenty of fresh air. I definitely appreciate my surroundings! For the rest of the day I will kick back a bit and cook dinner for my husband and his parents. If you are interested, the menu is cornish game hens with a red currant & raisin sauce, roasted sweet potato spears with bacon vinaigrette, mixed vegetable, and french silk pie for dessert. His mom usually cooks a meal so this year I decided it was my turn! I hope you all enjoy time with friends and family, and enjoy the beauty of your surroundings no matter where you are. The run, also known as a marathon, which by itself is an impressive endurance event. So after being in 60 degree water for over 90 minutes and on the bike for over 6 hours, it was time to start the marathon. I came off the bike and felt OK! I ran through transition to get my run bag. This time when I made it into the changing tent it was more like what I anticipated. A volunteer asked if I wanted help and I said yes. So she dumped it all out and I got what I needed. She filled my UCAN bottle with water (I had already opened the packed into the bottle earlier in the morning.) I used aquaphor on my feet to help prevent blisters and put on my fresh socks, tied my shoes, put a couple more gels in my pockets and was on my way. Sort of. Quick stop for some more sunscreen and then I needed to make a stop at the port-o-potty to take care of female business. Unfortunate timing, but as least I was prepared! I had to wait for one to open, but it wasn't long before I was running. Lap 1: As soon as I started running and first priority was to start getting in some electrolytes. The first aid station was just a little ways up so I took a few of my endurolytes with some water. I had 1 packet of chocolate UCAN in my handheld bottle, Hammer Gels in my pockets, and I tried to go slow, which was harder than you might think! Just past the first aid station I found I was running pretty much the same pace as a guy so we started to chat. We both were hoping to start at a 10 min/mile pace or slower, so when our first couple miles were sub-10, we had to focus to back off. It was a challenge to run that slow but we knew we wouldn't be able to maintain that for a full marathon. I believe his name was Mark. We stayed together for most of the first lap. His knee was bothering him (ITB issues) so around Papago Park I showed him a quick stretch that seemed to help. After a while he wanted to stop and stretch and I kept going. I didn't get his race number so I hope he finished OK! I grabbed some pretzels every few aid stations, sipped at my UCAN and aimed to take in a gel about every 45 minutes or so, depending on how I was feeling. another good race photo from Dad! 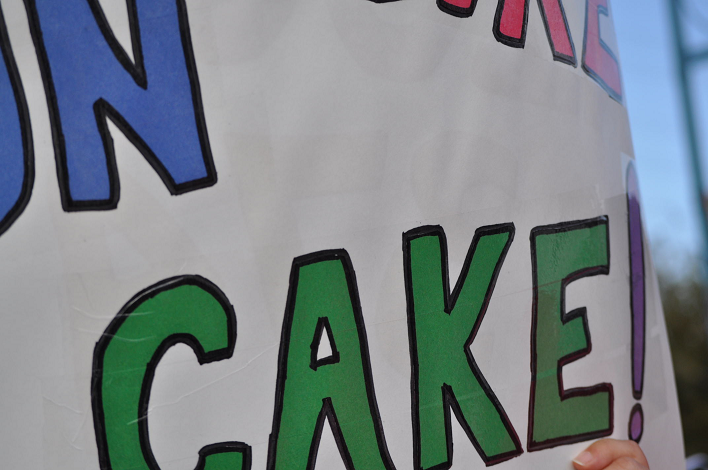 Lap 2: Each time I came through the park the family was there and I got to see the Swim - Bike - Run - Cake sign. Made me look forward to each lap. The sun was setting at this point which made the temps really comfortable for running. (Lap one I used water and sponges to help keep cool.) I believe it was this lap when I chatted with a guy who told me he was diagnosed with leukemia 3 weeks ago. The doctors OK'd him to start chemo after this race. The more I'm involved with TNT, the more reasons I get to stick with it. When I hit the aid station between miles 10 and 11, I decided to stop a port-o-potty because I had to pee again. I figured it was a good sign of hydration. And geez - it seemed after this I had to pee several more times and opted not to stop for those. 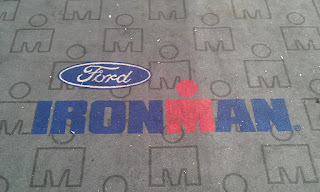 (it's an ironman thang, you wouldn't understand. hahaha.) I was feeling pretty good coming back over the Mill Street Bridge. TNT cheerleaders were everywhere! Just before mile 13 I got my special needs bag and refilled a UCAN, took a maalox that I had in there (thought it might help with some of the gas, although I was feeling fine, but still a little gassy...and to note, it's normal for me to get gassy on an empty stomach. My energy levels were good) I kept up with the pretzels, endurolytes, GenUCAN, and a gel every so often. When the chicken soup came out, I gave that a whirl. Salty goodness! I saw Kelly go by and guessed she was about 3-4 miles ahead of me. I also met up with Ron (@PunkRockRunner). He was hurting, but was hanging in there to rock this thing. 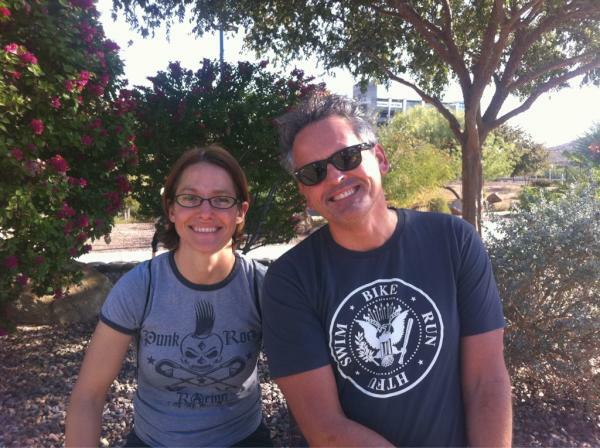 Near the top of the hill around Papago Park I caught up to Pam Schuckies, a triathlete I know from Boulder. (She ended up 3rd in her age group!). Sarah and Darby were at the Cops & Robbers aid station and this lap I stopped to give Sarah a hug to thank her for volunteering. Charley (a TNT coach who was one of my coaches for my very first triathlon in 2006) was in the park area near the Mill St bridge and cheering as I was coming around to start my 3rd lap. Great to see him! form is a bit sloppy here, but I am still smiling! Lap 3: Things get a little fuzzy...I ran this one on my own, mostly. I think.Chatted around mile 19-20 with a guy from Canada who told me I was doing great. 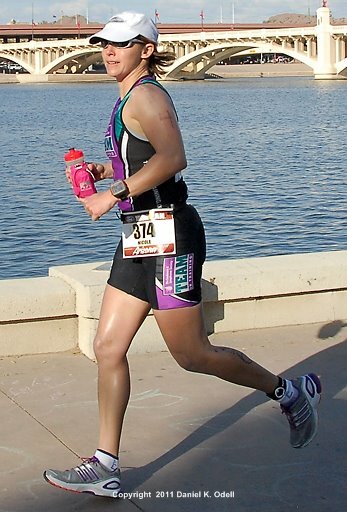 I was happy to be running the entire race and only walking aid stations. My body was definitely starting to hurt and I was slowing down. But I still stuck to the plan of going aid station to aid station and they did come up pretty quickly! I saw Kelly Ping one more time, pretty much in the same spot as before. I ran the Papago Hill with a gal from the LA Tri Club, although she was run/walking. She'd pass me running, and then I'd pass her while she walked. But at least I didn't have to walk up the hill! The downhill hurt a bit, but at this point there were only a few miles left! Once back on the Scottsdale Rd/Rural St. bridge I was soooo close. Team In Training supporters were cheering. The crowds were pretty thick and very encouraging on that last stretch. Charley was still there and I knew I'd see the family at the finish. The I heard someone yell, "Is that Nicole?" and it was Kelley Hess. Nice! 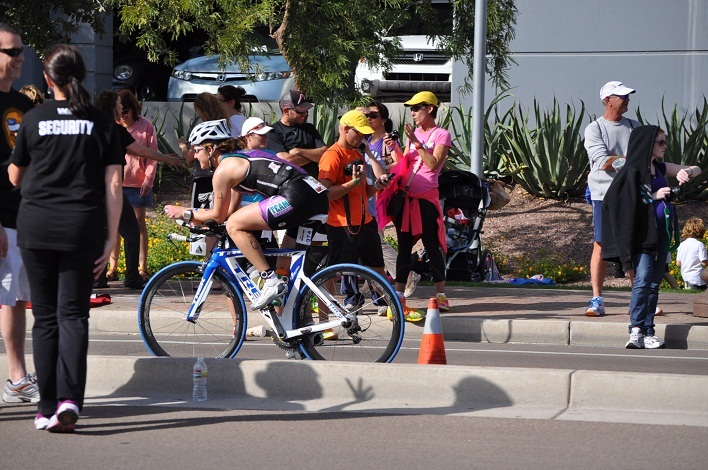 I made the left hand turn to head towards the finish line and was greeted by more cheering spectators. A TNT person handed me a LLS/TNT flag to carry down the finishing chute. So now I had something to wave. My arms went up and I waved the flag. I was yelling at and waving my arms at the crowds and getting them to cheer even louder. An epic day requires a very enthusiastic finish! I think this photo just about says it all. don't believe the HR for the first lap! So I did it! 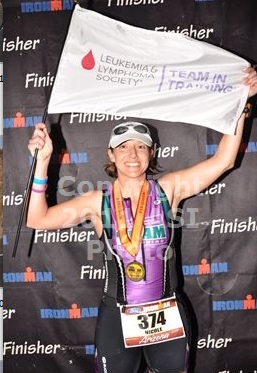 I completed an Ironman in 13:09:59! I stuck to my plan as best I could, felt pretty good the whole time. Never did I question that I wasn't going to get this thing done. 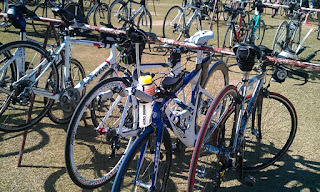 The weather cooperated, I had an awesome support crew there, I trusted the preparation I had done (thanks Coach Matt!) and really was out there to enjoy the day. I danced to the music at the aid stations, thanked the volunteers and probably felt as good as I can expect to out there! Huge, huge, HUGE thanks to everyone who helped me get here! As I made my was along the side walk to get my gear bag everything went as I expected. Volunteers yelled out your race number and grabbed your bike gear bag for you. I took it into the changing tent and...whoa. It was packed! People everywhere! I found a small space and did my best to get into a dry sports bra and top. Not the easiest thing when wet. Note: pack a small towel next time. I had some other athletes help me out, but this "glitch" in T1 made it a little longer than I wanted. I was thinking 7 minutes, it was 13:24, so almost twice as long. Once I ran out of the tent, I stopped at the sunscreen station to get covered and then headed towards my bike. The volunteers grabbed my bike and handed it to me. I ran to the mount line and was off! Now to my favorite part...the bike! There were several other people getting on their bikes at the same time so I took it easy to get on the road. No need to break any records before you are really on the course. At least for me. So I cruised and let my legs and the rest of me warm up. I had my garmin on my wrist and watched the power numbers. I started drinking and eating within the first 15 minutes. I had some catch up to do since I am sure I burned a lot of calories so just staying consistent was my plan. I had a couple bites of a clif bar on the half and full hour, and on the quarter and full hour I took a few swallows of my Generation UCAN bottles. I had two bottles of those with me, each with two packets - a protein (chocolate or vanilla) and a non-protein (cran-razz). The rest of my fluids were coming from my aerodrink, which I would refill with water from the aid stations and drop in a Nuun or Nathan Catalyst electrolyte tab. Lap 1: Skies were blue with some clouds, but the sun was out. Great day for riding! I was in the small chain ring for most of this keeping my watts in check. Legs and all felt good. I was eating and drinking to plan. Once I hit the turn around, I flew! Legs felt a bit sore, probably still warming up so I pushed a big ring for speed and allowed the slight downhill to propel me forwards. Then I had to pee. I decided not to do it on the bike so I stopped at a support station and had to wait a minute for a port-o-potty to open. I didn't mind the short break, and there was a lot there! Guess I was hydrating! I continued on my way and was back at the zig-zag part of the course. I decided it was time for more electrolytes in my aerodrink and when I grabbed them out of my little box I dropped the whole thing. Ooops. And remember those extra electrolytes I had with my bike pump. Yeah, they should have gone into special needs as a back up. 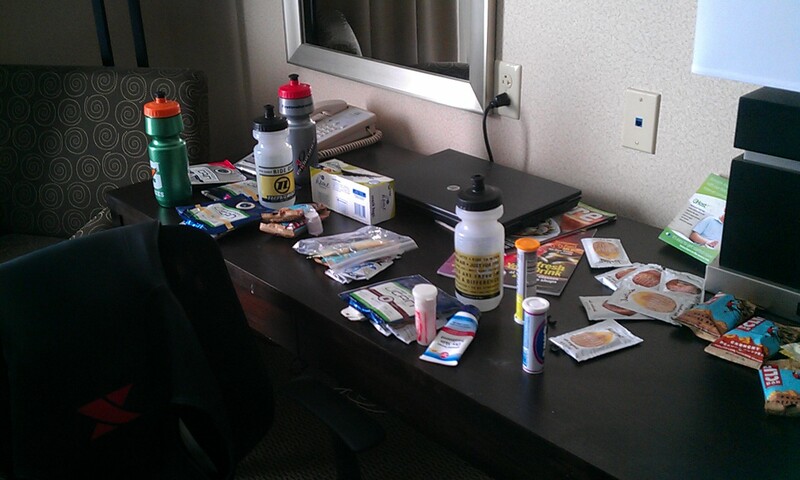 At least the clif bar and UCAN contains some electrolytes so I wasn't completely in the negative. When I hit the turn-around, there was the family cheering for me! 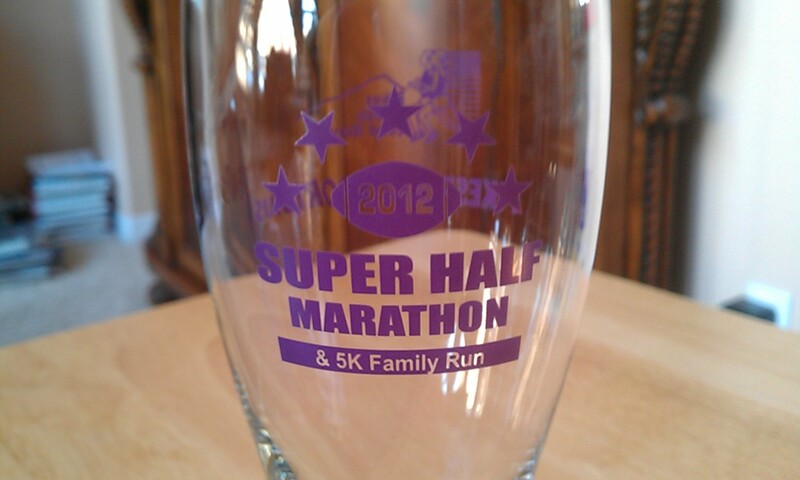 And I did the first lap in 2:04, so right on my expected pace. Lap 2: More of the same, but this time it felt a little easier climbing the last little bit up the beeline. I was a bit gassy and had a bit of a side stitch in my right side, but nothing major. All manageable and not unexpected. 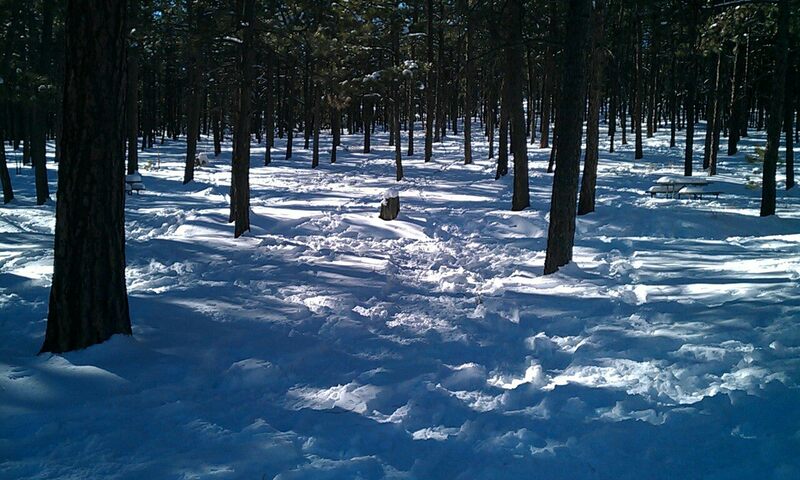 I stopped at the turn around aid station to pee, which made me feel better..ahhh!) and was assessing my lack of electrolyte consumption. No issues yet, but my calves were getting tight and there was a pain in my glute. All I could think of was my PT Gloria sticking those dry needles in that glute! Hahaha. Special needs was on this lap so I stopped and got a fresh bottle of UCAN, put a honey stinger waffle in my pocket and kept going. Quite the wind on this lap, but not worse than what I've ridden in on training rides! Around mile 75 I caught up to Shannon, one of my athletes. She was doing well and smiling! So great to see! Before I knew it I was back at the turn around. This lap was also around 2:04. And the family was there cheering! Dad snapped this good one! Lap 3: Last lap! I finished off my smaller UCAN bottle and tossed it at an aid station so I could put a bottle of Ironman Perform in my cage in case I needed it. I also tried to get a banana but missed at this early aid station. Calves were still a bit tight, glute was better and legs felt ok. I was able to get a half a banana at one of the last aid stations but didn't tap into the perform. Stopped to pee one more time at the turn around. Much less windy on this lap but still a bit of a headwind at times. When I passed the 100 mile marker I looked at the total time and it was 5:30. My fastest century ride! I rode with Dan from the Tri Club for a few minutes before I think he dropped back a little. I did pass a lot of people on the bike. I backed off a bit for the last couple miles to get them ready to run. As I turned into transition I heard my sister-in-law Traci yell and the family was there. Nice! This lap was around 2:03. Very consistent pacing for each lap! General comments on the bike course: Superb volunteer support. And wearing a TNT kit gets you sooooo many extra cheers! Tons of TNT supporters from the Georgia IronTeam chapter out and about. They ROCK. My friends Sarah Hunke and Darby Remly were helping out and it was great to see them. The banana and penguin were especially loud and enthusiastic. And of course there was tons of cowbell! Can't have a race without cowbell! How many race reports start with "my alarm went off at 4am"? This one is no different. I slept pretty well, or as well as I could expect, waking up a few times of course. I had done a good job of staying hydrated. Although I didn't mention this in my previous reports, I did have a bit of a sinus headache on Saturday so I did hope it would stay away on Sunday. It did. I woke up and started to get ready. Get dressed, eat breakfast, prepare bottles, and load up the car. The nerves were engaged, but manageable. I wanted to leave for the race site just before 5am and I was mostly on schedule. (I stress when I am late.) I figured if I got to transition at 5:30 I would have enough time to take care of everything before the start. Once I parked in the garage across from the race site, I was a person on a mission. I carried my load of stuff down to transition I made several stops. 1) First stop was transition to put my nutrition and bottles on bike, as that would take a lot of weight away from what I was carrying. I had UCAN in two bottles in the cages and water with an electrolyte tab in the aerodrink. 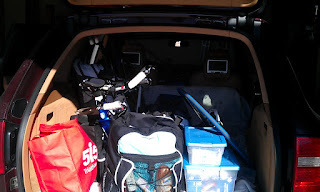 Then I pumped up the tires and loaded up my clif bars that I had already broken into pieces in plastic baggies. One of my athletes, Carley, was racked a few bikes from me and she showed up. 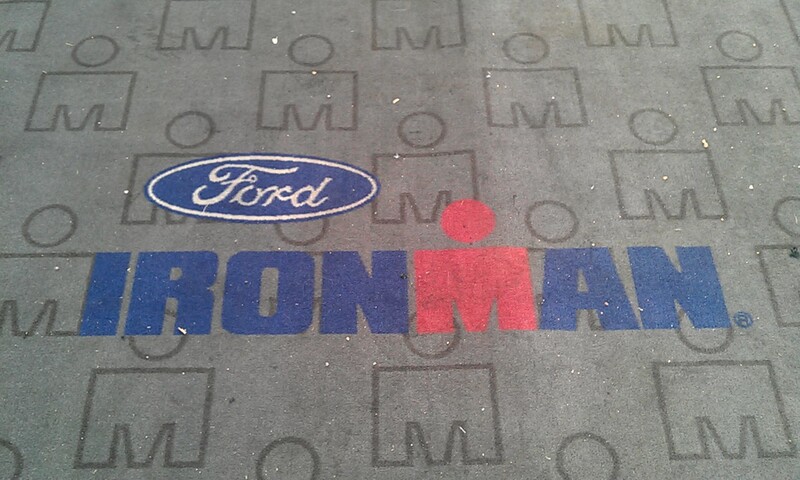 She was excited and ready to get this ironman underway! I also found Kelley Hess and said good morning. 2) Next was a quick stop at the port-o-potty since the line was short. Good idea. 3) Headed over to the gear bag section to make some tweaks. 4) Then was the short hike to drop off my special needs bags. 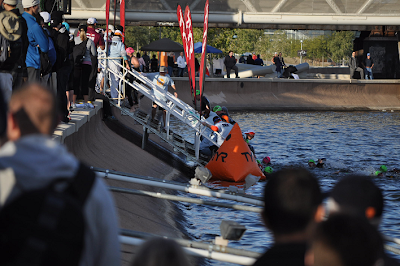 5) Stand in line for the port-o-potty one more time before putting on my wetsuit. By now it was just after 6am and I had planned to put my wetsuit on around 6:20. The line didn't move as fast as I would have liked, but it worked out just fine. And it was a good idea to stop. 6) I put my wetsuit on (I went with the long sleeved), packed everything I had except my bike pump and some extra electrolytes into my morning clothes bag and dropped it off with the volunteers. Now I was in line for the swim start! Carley found me again and we were ready to do this thing. We slowly made our way towards the start and chatted with a few other ladies around us. Carley wanted to be a bit further back, so I went ahead. I dropped my bottle I had been sipping with cran-razz UCAN, got on the dock and jumped in! 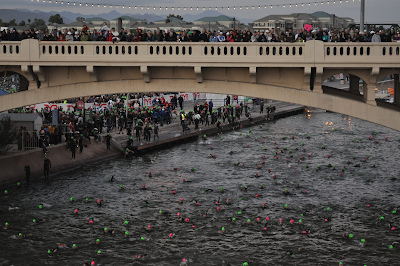 Jumping into the "lake" from the dock with spectators on the bridge above. My half ironman swims are ~45 minutes so 90 minutes would be a good swim for double that distance. After I jumped in the water, I was ready to go. Time to make my way to the start, which was past the bridge. I worked forwards and found an open spot under the bridge. And then the gun went off! Although a bit behind the line to start, I avoided the mass "washing machine" and fight for position. I also probably lost a couple minutes, but I wasn't concerned. I was here to enjoy the event and so I did. I swam along, bumping into a few people here and there, but I managed to stay really close to the buoy line. I had to stop once to let a small motor boat through (I believe he was race support) and yelled at a guy to stop for the boat. He asked if I was ok and once I pointed to the boat, he got it. Then we started swimming again and he clocked me in the back of the head. It wasn't hard and he apologized. I just kept swimming. Buoy to buoy. I was a little cold and glad I had the long sleeves on. On to the next bridge and then a bit past it for the turn and then back. My left hip flexor felt a bit funky, like it wanted to cramp, so every so often I would do a bicycle kick to keep it loose. At one point I thought my calf wanted to cramp as well, but it didn't. I really mostly thought, keep swimming and wow - you're doing an ironman swim! I was really comfortable the whole time and despite a few bumps into some people here and there, it was a good swim. I even got on someone's feet for a bit a few times. View from the bridge at the turn around. We have to swim back under that other bridge in the distance. Once I made the last turn I was pretty happy. Just a short swim back across the lake to the swim exit. We had to climb these steps to get out of the lake. Volunteers were helping pull us out. 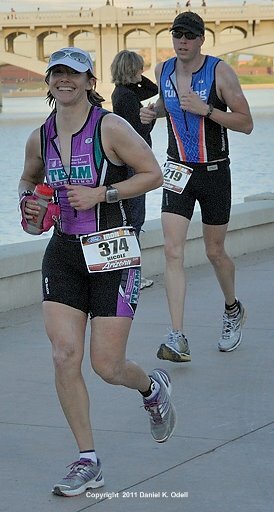 I was pretty darn happy to be done with my first ironman swim and feeling good. 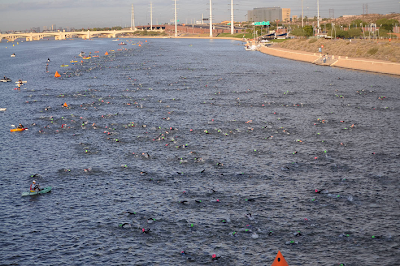 It was the longest swim I've ever done and I was glad that I was about to get on the bike. The wetsuit strippers did there thing (almost pulling a Justin Timberlake to Janet Jackson with my sports bra, but we got that fixed before I flashed the world!) I didn't bother with a space blanket and just walked/jogged with my cold, stiff legs to get my bike gear bag and get into the changing tent. Total swim time: 1:36:37. Pretty close to target considering I was "behind the line" when the gun went off. I woke up again on Saturday early and hungry (even though I ate a huge dinner the night before). Banana and Justin's Nut Butter were my morning snack to keep the growling stomach at bay. Then I took in a chocolate UCAN as I had my pre-race workout to do. They had Tempe Town Lake open with swim support (it is not usually a swimming lake, just boating) so we could check out the waters. I swam in my old long sleeved wetsuit since the temp was in the low 60s and I haven't worn this one in a few years. The water was cold when I got in and it did take my breath away slightly. My hands, feet, and face were cold at first, but after a few minutes it didn't feel so bad. It helped that the air temperature was warm. I was glad I got in the water so Sunday morning wouldn't be a complete shock to the system! I was also waffling between wetsuits. My long sleeved is old and takes on water, but it has long sleeves. My new XTERRA wetsuit is sleeveless but fits better. I was debating and talked to a few folks about it to get more input before making my final decision. I met up with Kelly Ping again and we went on a short bike and run after the swim. And big thanks to her dad for keeping an eye on our stuff. Legs were feeling good! 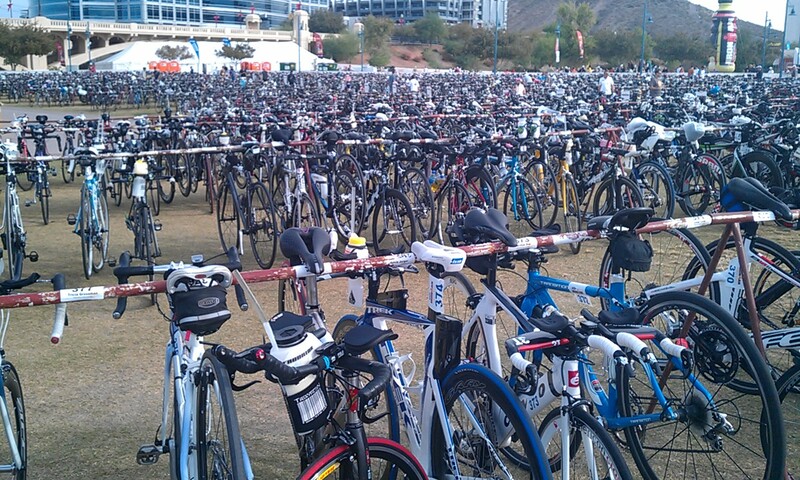 The line to drop off the bikes had diminished significantly so we checked in our bikes. Odd that they took a photo of the bike for "security reasons" but they do have a nice photo inventory of all the bikes! Tandem bike for a blind athlete. 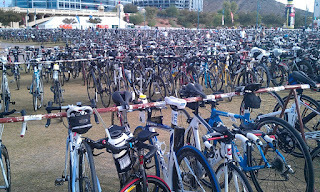 The transition area a little later...a sea of wheels. Kelly, her dad and I had lunch at Ncounter and then I headed back to the hotel to shower up and then pack up my gear bags and get them back to the race site. I also started to get my food around for the special needs bags. Once my gear bags were packed up I went back to the race site. 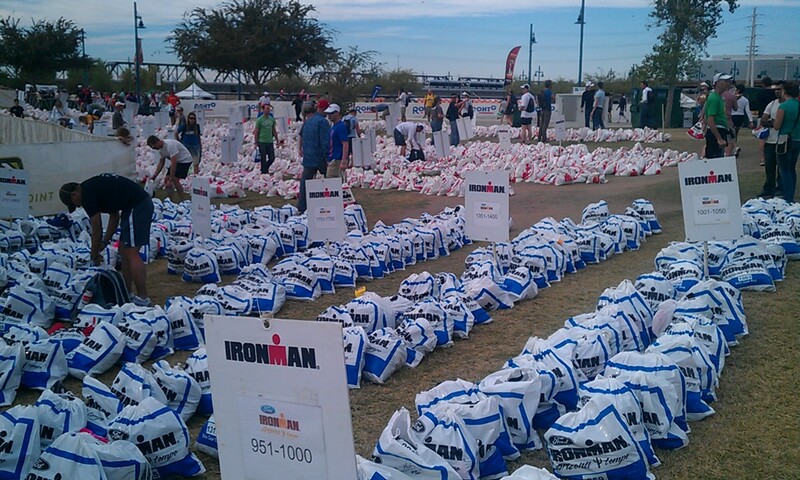 Gear bags for all the athletes! 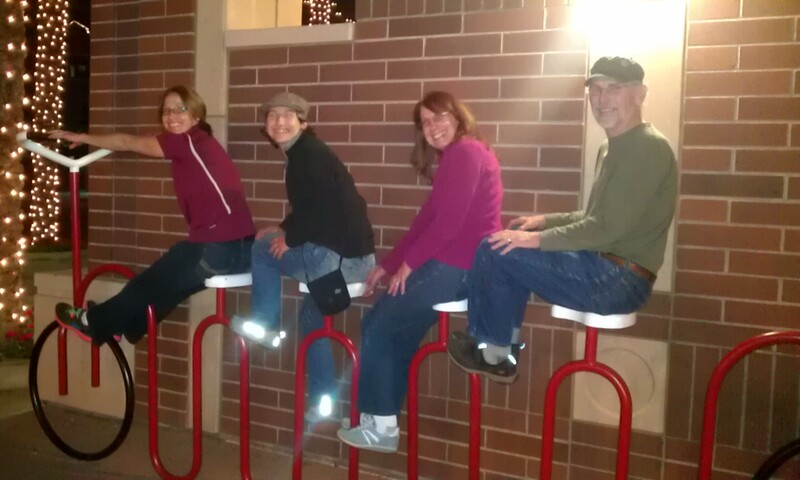 I ran into a few folks I knew (Steve and Michelle Vaughan, and Warren and Pam Schuckies.) Race excitement was here. I always get more nervous the day before a race, and setting out those gear bags were a definite indication that I was going to do this thing! I then headed back to the hotel one more time to get off my feet and make sure I was there when Tim arrived. Time to go over my race plan one more time and make sure my lists were together. 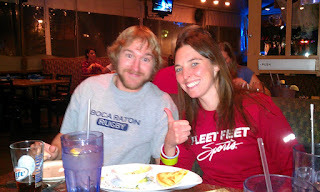 Tim showed up around 4:30 and we hung out until it was time to head to my pre-race dinner at P.F. Chang's. We met up with the rest of my family there. This was a popular place, because Shannon and her support crew were there, and Kelly was there with her dad. This was in the mall so Tim took a photo of the Odell clan! Yes! 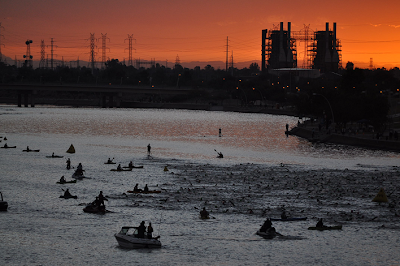 I finally get to write an Ironman race report! But before that, let's talk about the days before the race, as they are part of the experience as well. my stuff (and we did get another bike and more bags in there)! Kelly and I had driven to Arizona last year to be spectators, so it was great to be going down together as athletes! We wanted to stop in Las Vegas, but I got impatient when the Subway was farther off the interstate than anticipated. Unfortunately that was pretty much the last stop before Santa Fe. So just imagine two females, hungry, trying to stay hydrated with no bathrooms to be found. Yikes! Then we found a gas station and encountered a sign on the bathroom doors - all bathrooms out of order! Eeeeek! Fortunately we made it to a decent travel stop a few miles down the road with clean bathrooms and a Wendy's and gas station. We emptied one tank, filled up a couple others and continued on to Gallup, NM before calling it a night. Thursday, Nov 17th. After chowing down on the free continental breakfast (yay for hard boiled eggs!) we were on the road just after 7am. The ride was another nice one and we found a Subway just outside of Phoenix for lunch. (There was an In-N-Out burger, but because we had a bike/run to do, we opted against that!) I checked into the Holiday Inn near the Phoenix Airport, we changed into our bike gear and headed to the race site. 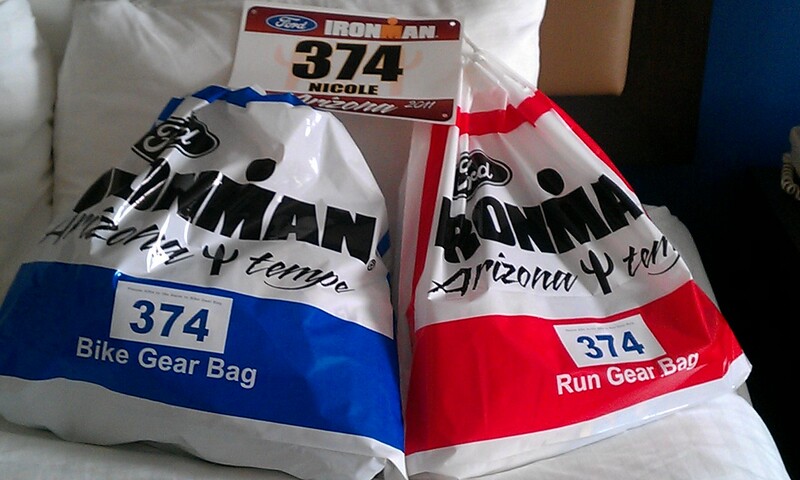 We checked in and got our race packets today to miss the lines that would likely be there on Friday. We also had about an hour to ride and 30 minutes to run so we checked out part of the bike course (yay flat course!) and some of the run (yay flat course!). And we felt pretty good with all the oxygen at 1500ft. After the ride we cleaned up at the hotel and then met Shannon and Cade at My Big Fat Greek Restaurant for some good chow. Shannon is ready to rock her 2nd Ironman! mmmmmm....gyro platter. An award winning one at that! Friday, Nov 18th: Sleeeeeep was on the menu so we slept in. Although I was waking up at 5am feeling rested and hungry! 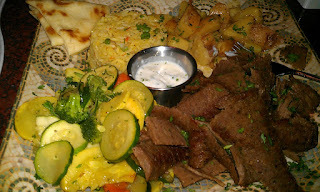 Once we got up and ready, we stopped at the Essence Bakery Cafe and got some hearty food. With a Sunday race, Friday is the day to make sure to get in the calories, and for some reason I was starving and waking up with a growling stomach. Then we hit up the expo briefly and met up with Ron on his way to check in. Punk Rock Racing ready to rock this thang! Then Kelly and I chilled out on Mill St before our noon massages and then grabbed some lunch at Gordon Biersch. Don't have a photo of that. Back to the hotel for more relaxing and starting to get stuff around. Kelly met up with her Dad and I opted to meet Khem and Tod for some appetizers before heading to the athlete meeting. We caught the end of the dinner and I met Lori (@LJ3000 on twitter) who was there to support her husband. I also met up with Kelley Hess (@KHesser) and Girls Heart Rockets teammate. She was going to dinner with her family and I became famished. Although tired and it was late, I decided to tag along. We got a really great and filling meal at Frank & Lupe's in Scottsdale. Kelley pounded 3 sopapilla's! Back to the hotel it was time for more sleeeeep! 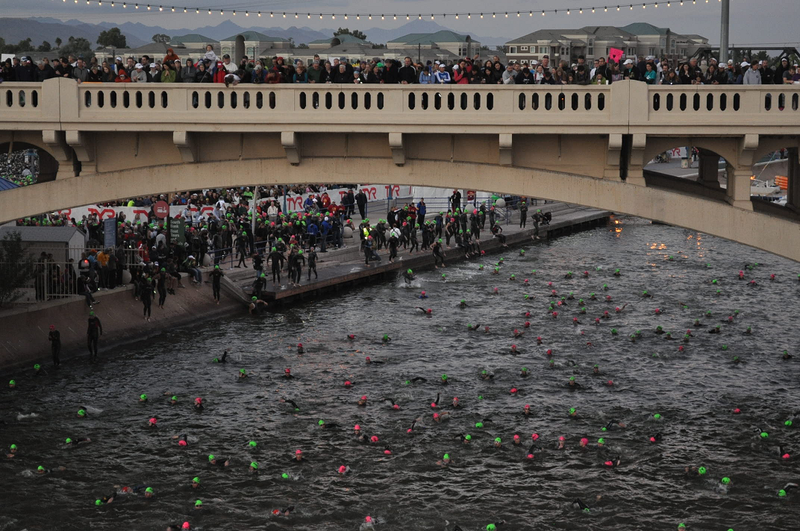 After today the countdown to Ironman Arizona is in the single digits. And only one more weekend before race weekend. It is starting to seem more real! I'm full on mid-taper as although I'm eating well and getting a decent amount of sleep, I'm still feeling a that tired feeling during the day. But all that is normal as my body adapts to all the training I put it through! then I had a 30minute run, so I bundled up a bit and hit my standard neighborhood route. I was really glad my legs were able to hit my power zones during the intervals and actually felt good! And my legs really flew along the sidewalk during the run! It was chilly and breezy, but I felt amazing. During my run, I got to reflect on a few things. 1) I just did a taper brick workout that took me the same amount of time as my first triathlon in 2006 (1:52). 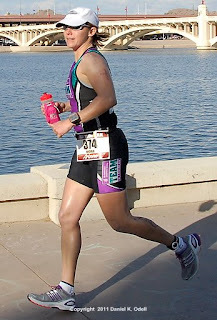 2) I was running an "endurance run" at a pace faster than my first sprint tri where I was maxed out. 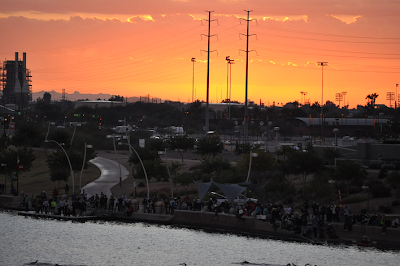 3) I was thinking how I want to enjoy my experience at Ironman Arizona, and I might go through ups and downs on race day, I've really enjoyed the training for it. So while I might go through mini-"freakouts" (don't we all before we do something new?) I'm excited for the experience and journey! Stay tuned as we get closer! There are twelve days until I toe the line for what I've been preparing for over the past year. A challenge that is surmountable, but it hasn't been an easy journey. I've blogged occasionally throughout my triathlon season with race reports. I'm in my taper now, and feeling the mix between rest and that odd taper fatigue. Here's a random recap of my season and some thoughts going forward. I started 2011 with some running races, including a very challenging 25k at Cheyenne Mountain State Park. 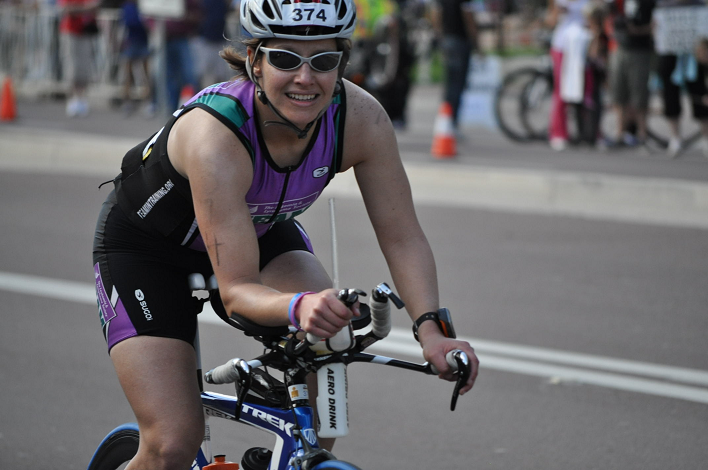 I've competed in 5 triathlons so far this season, with the first being in June. 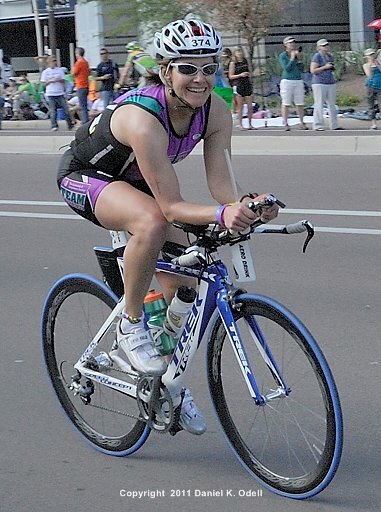 Ironman Arizona will be my 6th. I continued to coach for the Leukemia & Lymphoma Society's Team In Training Program. 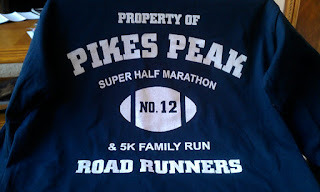 Check out my Challenge for all you who live in the Pikes Peak Region! According to my TrainingPeaks logs, since January 1st, I've spent 200 hours on my bike logging 3115 miles, 108 hours have been spend running 568 miles, and 293451 yards were swum over 125 hours. I've been a pin cushion for the last couple months while getting some dry needling therapy to help release some chronic trigger points. I can honestly say I've enjoyed my training and the challenge that it brings. I'm surprised I haven't been more fatigued while working full time, being a wife, coaching athletes, and training 15-20 hours per week. I've been getting 6.5-8 hours of sleep a night (would of course like more!) I think a lot has to do with my improved diet as I worked to be more metabolically efficient. Honestly, it freaks me out a little when I read ironman race reports and they all end in GI distress...let's hope my nutrition plan works! I'm a USA Triathlon and USA Cycling Certified Coach living in the Colorado Springs area. I am the Head Coach for NEO Endurance Sports & Fitness. In addition to this, I coach for The Leukemia & Lymphoma Society's Team In Training program. 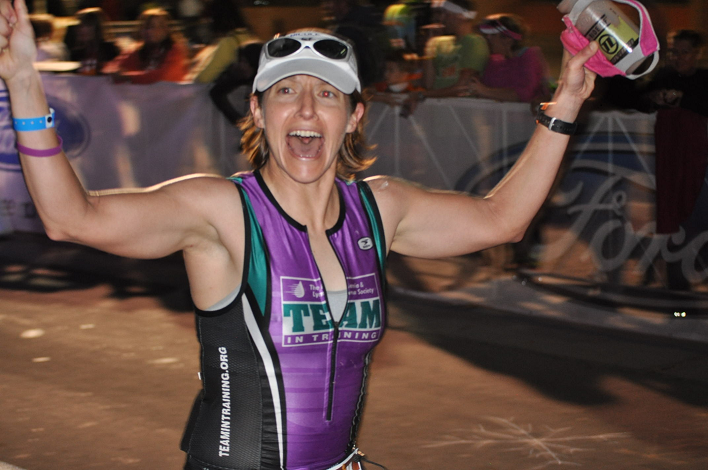 My passion is sharing my excitement for multisport with others.